Before we get started talking about your writing, tell us a little about yourself, where you’re from, what you do for a living (if you’re not a full time writer) what hobbies you have, etc. Whatever you’d like to share. Thanks Karen for having me on your Killer Bookshelf! I’m so glad to be here. I see myself as a mom who writes. We’ve got two little girls, a dog named Biscuit, two frogs, and two fish. I don’t have much time for hobbies other than reading, but we do enjoy traveling. We’ve lived overseas in Japan and hope to get back there for a visit soon. I wrote a lot when I was young. I initially majored in journalism and took creative writing classes, but after having a column on my local newspaper for a year in high school I found I didn’t like interviewing. I really had no idea in what other ways you could make a living writing. I changed my major and in a very roundabout way, I eventually got my teaching degree in history. Twenty years later, I was living in Japan, not working, and my children were in school full time. I finally had time to put the stories I’d kept in my head down on paper. Mystery with a strong dash of romance and humor. My Cherry Tucker series is set in small-town Georgia, so you could add Southern to that list. I’m also working on a paranormal mystery set in Japan. I guess I fall back on mystery as a plot, because I enjoy reading mysteries and like to work out the puzzle. I’m open to writing other types of genres. Except math. If that’s a genre. When the writing starts to flow and I feel like I’m along for the ride. It feels magical. When the writing isn’t flowing and I fear it’s not going to come to me. Usually I’ll get them spontaneously while I’m doing something else. Something I see or hear will trigger an idea. I got the murder mystery idea for Cherry Tucker’s fifth book while I was at a wedding recently. One way I don’t get ideas is to sit down and try to think of ideas. My brain doesn’t like to cooperate. That is a good question. I think my heroine, Cherry Tucker, is not a very good detective for an amateur sleuth mystery. She’s also stubborn, sassy, and tenacious which gets her in a lot of trouble. But I hope it makes for an entertaining read to see her figure her way out of the situations she’s come into backwards and upside down. Not literally backwards and upside down. At least not every time. I was an avid reader before writing full time. I used to read two or three books a week. Now I’m lucky to read three books a month because of my writing schedule, but when I’m on vacations I read a lot. I was on vacation for a week in late June and read three books. Felt very proud of myself. I do read in my genre, particularly my fellow Henery Press author’s books, but I like all kinds of fiction. I like quirky, humorous books whether they are romance, mystery, thrillers, paranormal, or literary fiction. Particularly if they have some kind of romantic tension. And no math. Cherry’s jamming gears between trailer parks, Atlanta mansions, and trucker bars searching for the hijacker who left a widow and orphan destitute. While she seeks to help the misfortunate and save her local reputation, Cherry’s hammer down attitude has her facing the headlights of an oncoming killer. I’m very thrilled that both my editor and my early readers all said that HIJACK is their favorite Cherry Tucker story so far. It’s mine, too. But I start writing number four in August, so I hope that one becomes my favorite. Or maybe number five. Links to LARISSA’s website, blog, books, etc. 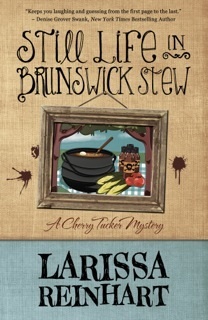 BE SURE TO COME BACK to read more about Larissa and her novel, STILL LIFE IN BRUNSWICK STEW, on Wednesday’s Karen’s Killer Book Bench!! Happy Reading! 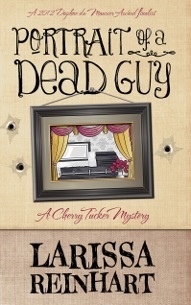 **SPECIAL ANNOUNCEMENT: Larissa will give away an eBook (Kindle, Nook, Kobo, or iBook, reader choice) of her release, PORTRAIT OF A DEAD GUY, to one of her lucky readers who comments on either her Monday Interview or Wednesday Book Bench blogs!! Winner will be randomly selected and announced Monday, July 29, 2013. Thanks, Larissa, for sharing your stories with us! Thanks so much for having me on, Karen! Great questions. Good luck to the commenters in winning the e-book! What a great interview. Everything written by Larissa is so well written and so much fun to read; can’t wait for each new book to come out. Great interview! Can we look forward to seeing a trip to Japan in Cherry’s future? Thanks Cynthia! You are so sweet! I love your books and your sense of humor. It was interesting to learn more about you! Good luck and keep bringing us Cherry Tucker stories! Thanks Jerrie! I will do my best to bring you more. Number 3, HIJACK IN ABSTRACT, is coming out in November and #4 is due out early next summer. Larissa, I can’t wait to read HIJACK! This is the first time I”ve heard anything about the story line, and it sounds so good! Her start in writing is similar to mine. Except I wrote for the paper when I was thirteen. I don’t have a history degree, but I have two bookcases filled with history books. I didn’t really start writing though until I retired. Loved the interview. I Tweeted it for you both.